Meet Danny(red) and Nikki(cream). The future breeding pair were left at the local Shelter when the owners were moving and could not take them with them. Their time was up at the shelter and AARTA came in to help us out since we had no space to put them. They are now safe and will be altered prior to placement. Danny depends on Nikki as she is more dominant then he. Danny will wait for Nikki to eat and then will approach the bowl. Danny is an especially good kisser. They are a happy and enjoyable pair. We would like to see them placed together since they are bonded. We are especially grateful to Akita Rescue for taking in this young pair of Shibas when we could not find space before their time was up. 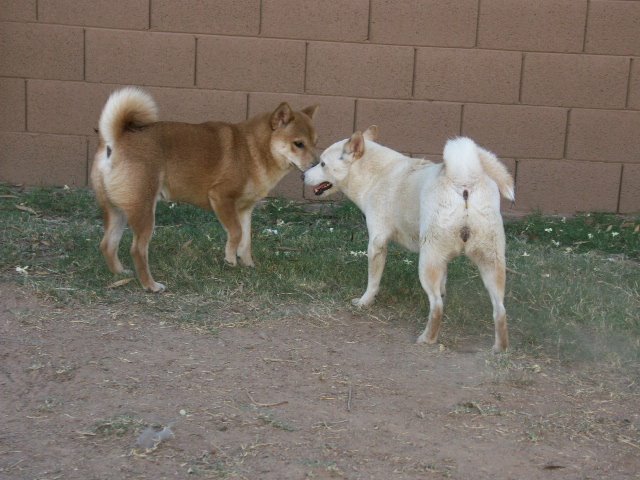 If you were thinking of adopting one Shiba, you might as well go for two. Most adopters find that one is not enough of this special little breed. For more information and to fill out an application for Danny and Nikki go to www.petfinder.com and search for Shiba Inu in Arizona.